Whether you need a barn for livestock, farm equipment or hay and grain storage, American Steel Span has just the barn, the steel barn, for you. Steel barns provide safe secure housing for all of your agricultural needs and come in sizes from 10¡¯ to 100¡¯ in width and unlimited lengths. Metal barns will withstand the worst that Mother Nature has to offer and are versatile enough to house livestock or a vintage model tractor. 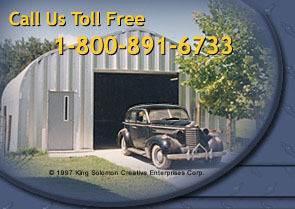 Steel barns are remarkably affordable. You save up to 60% over the cost of conventional construction with your purchase of a steel barn from American Steel Span. These barns go up in a matter of days without the need for special tools or equipment. All barns are custom made to your specifications and you can count on friendly customer service personnel to guide you every step of the way from purchase to completion of your steel barn.